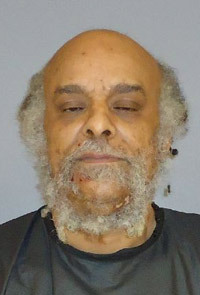 Shaune Lawrence is a resident of 5 Fleming Court in Palm Coast. Early this morning (at 4 a.m.) he called 911 to report a home invasion. He told deputies that two men had tried to rob him. Deputies spoke with Lawrence, 54, and gained consent to enter his home–to search for the two men who were purportedly still inside. 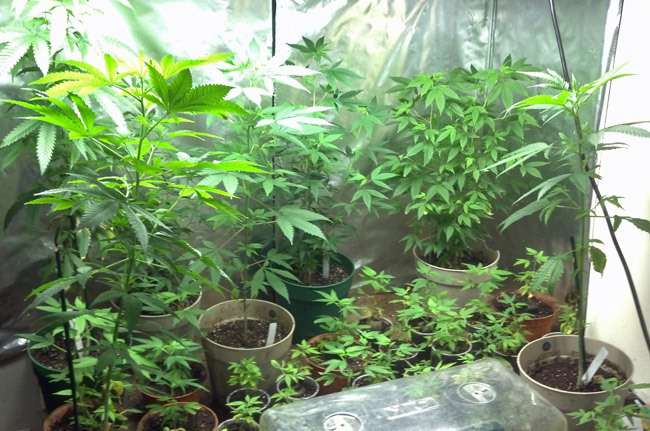 Instead of finding the men, deputies discovered a spare bedroom and a bathroom used as active marijuana “grow rooms.” The rooms had an elaborate grow setup with lights and chemicals used for cultivating pot, the Flagler County Sheriff’s Office reported. The alleged robbers were not found in the house. Deputies dismantled the grow equipment. A total of 110 marijuana plants were removed from the residence by Sheriff’s Office detectives called to the scene. At full potential, these plants would have yielded 55 pounds of marijuana with a street value of $44,000. Lawrence is charged with cultivating marijuana, possession of more than 20 grams of marijuana and possession of drug paraphernalia. He’s being held on $5,000 bond. Lawrence’s is the fourth busted pot house in Palm Coast in the last 10 months. In February, the Sheriff’s Office busted a marijuana-grow house at 20 Princeton Lane in Palm Coast, where the plant count was cleverly kept at 24, one short of triggering the stiffer penalties. In June, a woman unraveled her husband’s operation after she discovered he’d been growing pot at 111 Birchwood Drive, where cops discovered an elaborate grow house with a ventilation system. And late last month at yet another house, at 15 Wheatfield Drive, the sheriff’s office removed 48 plants. As many other states are either legalizing pot, decriminalizing its possession or, like the federal government, diminishing enforcement of existing laws prohibiting pot growing or possession, Florida continues to take a harsher approach, though there have been faint attempts to legalize medical marijuana. Advocates of legalization have been encouraged by the trend in other states. “I truly believe this is the year we’re going to see some leadership on this issue,” Jodi James, executive director of the Florida Cannabis Action Network (FLCAN), told Sunshine State News in November. FLCAN calls itself the state’s leading marijuana reform group. A street value of $44K? Will somebody please tell me what street this is as I have a garage full of junk to unload. Normally I would just complain about police resources being used to confiscate natural growing plant life but in this case the owner “allows” the police to enter and search his property. He must have been asleep during his civics classes especially the 4th that protects against unreasonable search and seizures…. but then again this guy doesn’t strike me as a Mensa member. One should never voluntarily give up your Constitutional rights. The tip of the iceberg !!! No jobs………… Gotta make some $ someway, beats stealing or robbing someone at gunpoint. Legalize it tax the growers and consumers…………..end of problem. It is a crying shame that Flagler County Sheriffs office can take you to jail for a roach in your ashtray. If that was a rental home ..did the landlord do any background check of his renter? The cops shouldn’t be worried about grows like this they should be more worried about all the Meth labs in the mondecks! Gotta love these guys who get so high on the pot they are growing , they forget its still illegal in the State of Floriduh , Why in the world would you call police to search your house when you know you have pot plants growing in two rooms. I`m sure it wasn t the big bust they say it is , things always seem to be blown out of proportion here , like a hand grenade lighter in a tree, that closes down neighborhoods for hrs, or some guy arguing with his wife while buttering his toast , 8 hrs later swat team arrest him for threatening her with a deadly weapon , kind of reminds me of that song Alice`s Restaurant, with the helicopters and 8×10 colored glossy photo`s of an envelope under a pile of garbage. Guy probably had 4 or 5 saplings and a bunch of seeds in wet paper towels that sprouted. One morning at work I was bringing pallets of sod around the front of our store , a woman who looked to be 80 or older, forgot to use her turn signal with a cop behind her , he pulled her over , when I came back with another load, there were 3 cop cars and 5 deputies outside her window , the little old lady shook her head and mouthed idiots to me , cracks me up everytime I see them with someone pulled over, doing the exact same thing. he is not too intelligent, engaged in illegal activity and he invites law enforcement over. Wasn’t their a another pot bust just recently , that had another older black man living in a home ? Sounds suspicious. If this is a rental, doesn’t the landlord or property manager do a background checks on these people ? Gotta love all the legalize “Marijuana” propaganda. Just like the legal opiate based pill mills. If somebody doesn’t want to pay or can’t pay for a mind altering plant, substance or whatever. Ready or not they are coming for yours anyway they have to. Lol Anonymous , no one will ever come looking to rob you of pot if it is legal , you don t get addicted to it like opiates, do they come try and rob your beer? , because beer is more addicting then pot, and so is cigarettes, don t speak of that in which you do not know,there is no such thing as reefer madness, its another fable this backward government tried to portray on society. Had there been a video taken, it would be a candidate for World’s Dumbest … He allowed the police to enter the home to search… I’m still laughing. ANOTHER grow house in Paradise Palm Coast?? Aren’t ALL the drugs suppose to be in Mondex? Wasn’t their a recent pot bust recently, that involved another older man living in a home. Seems suspicious. If this home was a rental how come the owner of the property manager do background checks on this guys. Fifty-four??? Wow, if that’s what pot does to you, I don’t want it! I believe that to attract less attention, weeds are now grown in the city (urban setting) and sold in the Mondex (countryside). You guys there have enough surveillance now, with the home made moonshine as reported earlier. Looks like some elder folks are in need to make a living nowadays. Our unemployment rate still high…. No problem sir. If your case is resolved as the others, you will only get probation. Meanwhile, across the country you can actually take legal classes that teach you how to grow marijuana. He was pretty dumb to call the police because you think you have been robbed .. meanwhile .. you are growing pot in a couple of the rooms … brilliant.